An estimated 28,000 lemurs, the world's most endangered primates, have been illegally kept as pets in urban areas of Madagascar over the past three years, possibly threatening conservation efforts and hastening the extinction of some of lemur species, according to a study by Temple University researchers. The researchers published the findings, "Live capture and ownership of lemurs in Madagascar: extent and conservation implications," online Jan. 5, in the international conservation journal, Oryx. Led by Temple biology doctoral student Kim Reuter, the researchers spent three months in Madagascar surveying over 1,000 households in 17 cities and villages across the country's northern half about pet lemur ownership, which is illegal. 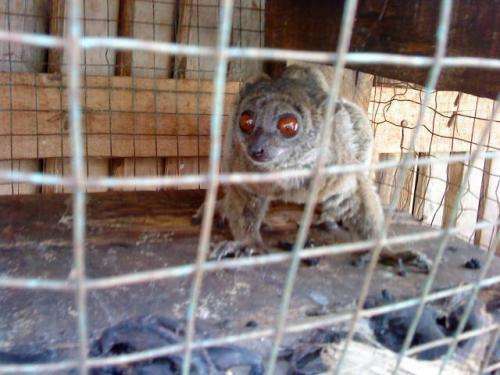 "We've been spending millions of dollars on lemur conservation in Madagascar, but despite spending all this money, no one has ever quantified the threat from the in-country pet lemur trade," said Reuter. "If we're spending these millions of dollars there to preserve these species, we should actually examine all the threats facing lemurs." "We estimated that over 28 thousand lemurs are kept illegally as pets in Malagasy cities over the last three years alone," said Reuter, who has recently been appointed to the International Union for Conservation of Nature Species Survival Commission's Primate Specialist Group. "You see it everywhere; even government officials and the people who are supposed to be enforcing the ban on pet lemurs own them." With at least 14 lemur species having populations of less than 10 thousand, Reuter said Madagascar's extensive lemur pet ownership could be quickly driving some species closer to extinction, while even causing some populations to go extinct altogether. "Now that we know that lemur pet ownership is happening, and happening at this scale, it's an issue that we can't ignore anymore," she said, adding that lemur pet ownership must be factored into future conservation efforts. "If people are going to keep lemurs as pets, then more outreach, regulation and enforcement is needed to ensure healthier captivity for the lemurs, especially in the big cities," said Reuter, a research fellow at Conservation International while completing her Temple doctoral dissertation. "Conservation programs that don't consider the pet trade of lemurs may unnecessarily increase their costs and risk extinction of the very lemur populations that they are trying to protect."